Lauren Oliver is officially one of my favorite authors. All of the books I've read by her -- Before I Fall, Delirium, and now Pandemonium -- have absolutely blown me away. All of her books are beautiful and jam packed with emotion. She has this amazing way of writing, where the words flow seamlessly, and the descriptions are so perfect that the entire book comes to life while you read it. She effortlessly weaves backstory through the novel, breathing life into each character she writes. Anyway, enough about me talking about Lauren Oliver's amazing writing skills, and onto my review of Pandemonium! The end of Delirium left me in tears. I closed the book and was sad for a fews days, because I COULDN'T BELIEVE it ended the way it did. I thought it was a standalone, because I couldn't imagine how the series could be continued after the dramatic ending in Delirium. 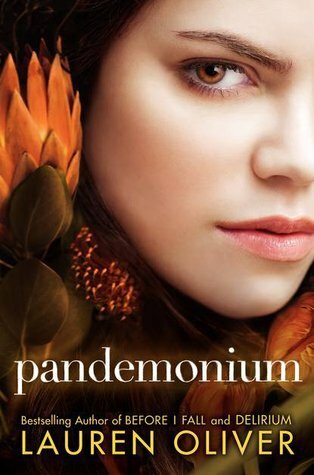 But I was so happy when I heard Pandemonium was coming out! There was also a part of me that was worried as well, because with the way Delirium ended, I knew the characters I'd come to know and love in Delirium would most likely not be in Pandemonium. And I was right -- the only character in Pandemonium from Delirium was Lena, although Lena did think about her friends and family from Portland throughout the book. BUT Lauren Oliver made it work! I literally couldn't put Pandemonium down when I was reading. Now that she's out in the Wilds, Lena has changed so much from the girl we first met in Delirium. She's tough and strong, and learns that life in the Wilds isn't as perfect as she imagined. We meet lots of new characters, and learn that the Resistance isn't what Lena originally thought it would be. We experience Lena's grief, and we journey with her as she goes on a mission of her own. We also get to see Lena fall in love again, this time with someone totally unexpected. Then there was the ending. Lauren Oliver shocked me with the ending of Delirium, and did it again with the ending of Pandemonium. All I can say is -- I wasn't expecting that, OMG, and I need book three NOW! If you haven't read anything by Lauren Oliver yet, do yourself a favor and pick up one of her books! You'll be happy you did. She's easily one of the best writers to hit the current YA scene. Every book she writes entrances me and leaves me wanting more. I can't wait to see how she ends the incredible Delirium Trilogy! I am soooo looking forward to my paycheck this weekend! :D It's all going towards books starting with books by Lauren Oliver. I hope you enjoy Lauren Oliver's books! They're all AMAZING! It seems like an educational blog which always some new information to visitors. Thanks for sharing the information. This blog is providing beautiful news about the Liberian Educational Sector. It is nice to know about it this is useful information. And such blogs makes us familiar with the whole world. Its wonderful blog really very nice site and blog facility.every title is very nice and very fantastic concept. Thanks for sharing the information. Nice blog though information provided you is so easy to understand but it is nice to comment on such blog where people can read such interesting posts. I should say thanks to you to share such an interesting and informative article for us. I am extremely anxious from this interesting post. It has amazing information which a person wish to find. I learned a lot of new things which explores my acquaintance in various developments. So I must be pleased about your efforts on posting this information. And hope you will be keep posting such an informatics post.